cRadiology/Neuroradiology (F.J.A.M., M.P. ), Radboud University Nijmegen Medical Centre, Nijmegen, The Netherlands. SUMMARY: MR angiography is proposed as a safer and less expensive alternative to the reference standard, DSA, in the follow-up of intracranial aneurysms treated with endovascular coil occlusion. We performed a systematic review and meta-analysis to evaluate the accuracy of TOF-MRA and contrast-enhanced MRA in detecting residual flow in the follow-up of coiled intracranial aneurysms. Literature was reviewed through the PubMed, Cochrane, and EMBASE data bases. In comparison with DSA, the sensitivity of TOF-MRA was 86% (95% CI: 82–89%), with a specificity of 84% (95% CI: 81–88%), for the detection of any recurrent flow. For contrast-enhanced MRA, the sensitivity and specificity were 86% (95% CI: 82–89%) and 89% (95% CI: 85–92%), respectively. Both TOF-MRA and contrast-enhanced MRA are shown to be highly accurate for detection of any recanalization in intracranial aneurysms treated with endovascular coil occlusion. MRA can be used for follow-up of coiled intracranial aneurysms, with TOF and contrast-enhanced (CE) MRA being the most commonly used techniques currently available. MRA eliminates the risks of cerebral thromboembolism and ionizing radiation. There is, however, a continuing debate about which of these 2 MRA techniques is best suited for aneurysm follow-up. 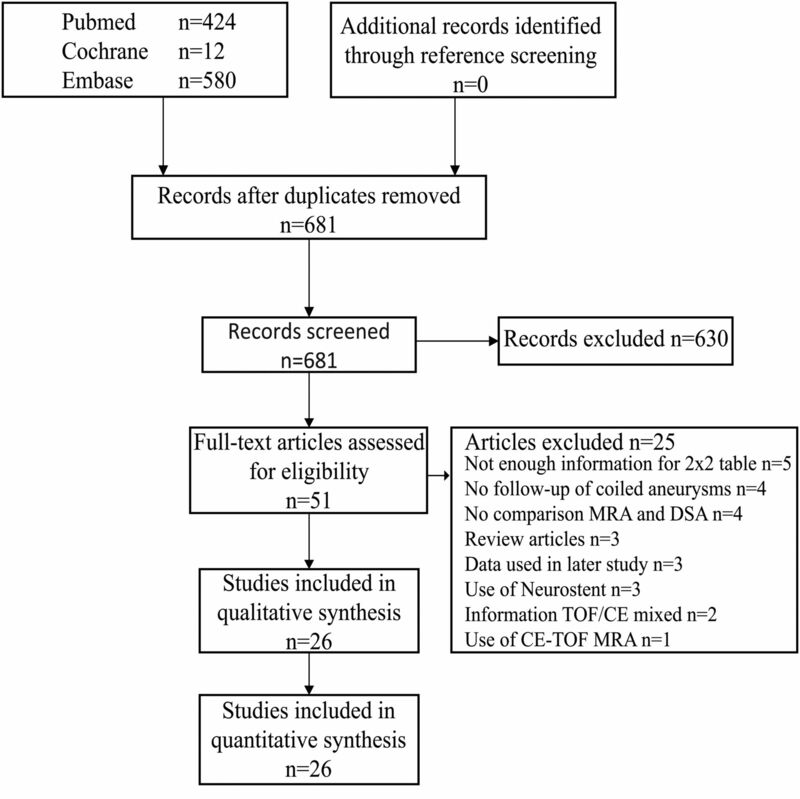 The systematic review and meta-analysis performed by Kwee and Kwee8 in 2007 compared TOF-MRA and CE-MRA with DSA for follow-up of coiled aneurysms. The analysis revealed a moderate to high diagnostic performance of both MRA techniques. Because of the moderate methodologic quality of the studies available at the time, Kwee and Kwee8 could not conclude whether MRA can replace DSA as the standard method of reference. Since then, the number of studies on this subject has more than doubled, and study setup and statistical methodology have substantially improved. The goal of the current study is to systematically review the medical literature to establish whether TOF-MRA and CE-MRA can now be considered good enough for follow-up of patients with coiled intracranial aneurysms. The medical literature comparing MRA and DSA for evaluating intracranial aneurysms after coiling was reviewed through the use of a variety of data bases—PubMed, EMBASE, and the Cochrane Library—and was updated until March 2012 (On-line Table 1). After an initial search of the literature by an experienced librarian, duplicate publications were removed. From the pooled list of publications, 2 researchers (M.J.v.A. and H.D.B.) independently reviewed the titles and abstracts of the articles. Studies were excluded if they did not compare MRA with DSA for follow-up of patients with intracranial aneurysms treated with endovascular coil occlusion. Conference abstracts, reviews, editorials, meta-analyses, and animal studies were also excluded. Only articles in English were screened. From the remaining articles, full-text versions were obtained and were independently evaluated by the same researchers (M.J.v.A. and H.D.B.). Studies were eligible for inclusion if they 1) evaluated MRA and DSA for follow-up of patients with intracranial aneurysms treated with endovascular coil occlusion; 2) contained data for 2 × 2 contingency tables; 3) used the Raymond et al classification or other compatible scales to grade recurrent flow in intracranial aneurysms9⇓–11; 4) analyzed TOF and CE MRA separately; and 5) provided data that excluded stent-assisted coiling of intracranial aneurysms. If the same data were used in more than 1 article, the most recent version was included. If the 2 researchers disagreed about selection of articles, an independent third reviewer (R.H.M.A.B.) decided the outcome. The Grades of Recommendation, Assessment, Development, and Evaluation (GRADE) method was used to assess the methodologic quality of the studies included in this review.12⇓⇓⇓⇓⇓⇓⇓⇓⇓–22 The studies were independently assessed by the 2 researchers (M.J.v.A. and H.D.B.) for limitations, indirectness, inconsistency, imprecision, and publication bias. Agreement between the researchers was quantified by use of Cohen κ.23 In the case of disagreement, a third reviewer (R.H.M.A.B.) made the final decision. 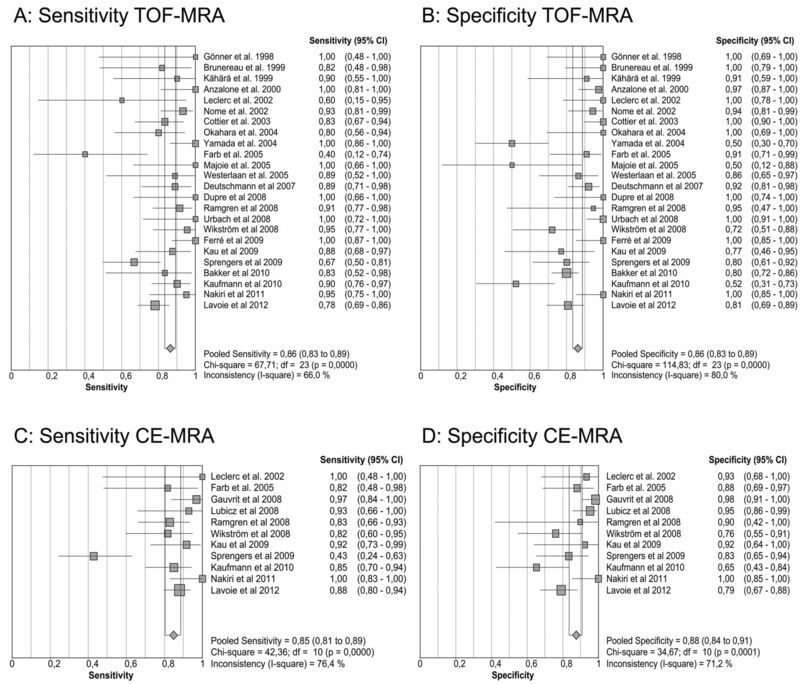 The pooled results for the sensitivity and specificity of TOF-MRA and CE-MRA are presented in Table 1. The sensitivity and specificity for the detection of any recanalization, meaning residual neck or residual aneurysm, are shown in Fig 2A–D. TOF-MRA had both a pooled sensitivity and specificity of 86% (95% CI: 83–89%). Pooled sensitivity and specificity of CE-MRA were 85% (95% CI: 81–89%) and 88% (95% CI: 84–91%), respectively. SROC curves are displayed in Fig 3A,-B for TOF-MRA and CE-MRA. As shown in Fig 2A–D, the results were subject to heterogeneity, with I2 values ranging between 66–80%. For subanalysis, different study variables were distinguished: retrospective versus prospective studies, 2D versus 3D DSA, different MR field strengths, GRADE criteria, and weighted results according to GRADE (Table 2). Pooled sensitivity/specificity in detecting any recurrent flow. A, Sensitivity for TOF-MRA. B, Specificity for TOF-MRA. C, Sensitivity for CE-MRA. D, Specificity for CE-MRA. A, Summary receiver operating characteristic for TOF-MRA. B, Summary receiver operating characteristic for CE-MRA. The results of our meta-analysis reveal that MRA now has a high degree of sensitivity and specificity in detecting any recanalization during the follow-up of coiled intracranial aneurysms. However, a subanalysis for residual neck or residual aneurysm (Raymond scale 2 or 3, respectively) revealed lower sensitivity and specificity of both MRA techniques compared with DSA as the reference standard (Table 1). A possible explanation is the small number of studies and patients included therein, which is reflected in the large 95% confidence intervals. Another potential explanation is false-positive findings seen on DSA possibly caused by pulsation artifacts.48 However, this comparison makes MRA the reference standard compared with DSA. Because our study compared MRA with the reference standard, DSA, these cases also were judged in favor of DSA. This results in false-negative values for the MRA and a lower sensitivity. This subanalysis also showed lower sensitivities of the CE-MRA compared with the TOF-MRA for the detection of residual neck or residual aneurysm. The contrast timing together with the narrow interval of scanning in CE-MRA might be the cause of this lower sensitivity. The short time window between the arterial and venous phase of contrast enhancement to avoid venous enhancement and vessel overlap lowers the spatial resolution.60 Additionally, the acquisition time for TOF-MRA is much longer compared with CE images, leading to improved resolution. The disadvantage of TOF-MRA is its limited coverage; however, TOF is adequate for the evaluation of intracranial vessels. Suboptimal imaging in CE-MRA may therefore lead to more false-negative values, especially in small remnants, lowering the sensitivity. Significant sources of heterogeneity in this meta-analysis are variations in study design and reporting of data. Evaluation of the studies revealed 5 possible explanations for this heterogeneity: 1) Publication bias remains a potential cause of heterogeneity, because articles with better results are more likely to be published than studies with insignificant or negative findings. 2) Not all of the studies had a prospective design and enrolled patients consecutively, which can be a cause of bias.76 Sixteen of the 26 were prospective27,28,32,36,38,42,55,60⇓–62,64,68⇓–70,74,75; only 12 studies included consecutive patients.28,32,42,48,56,60,61,64,66,69,74,75 Retrospective studies tended to be better, with low heterogeneity, compared with the results of the prospective studies, though these findings were not statistically significant (Table 2). 3) For the reference standard, 8 reference studies used 3D (rotational) DSA for comparison to MRA,38,39,56,59,66,69,70,74 whereas the other studies used 2D DSA. Because 3D DSA is better at evaluating recurrent flow in intracranial aneurysms,77,78 the use of the 2D DSA may reduce calculated specificity but also increase calculated sensitivity of MRA if a true recanalization is missed by DSA. The use of DSA as the reference standard will potentially cause DSA false-negative values to count as MRA false-positive values. In general, MRA tends to perform better when compared with 3D DSA than when compared with 2D DSA (Table 2). 4) Heterogeneity may also be caused by different field strengths used in the various studies.79,80 Five studies only researched 3T MRA,42,61,64,68,74 whereas 2 articles studied both 3T and 1.5T MRA techniques.60,70 Two studies were performed with a 1T scanner.27,33 The rest of the articles evaluated MRA by use of 1.5T units. There is a trend toward higher pooled sensitivity and specificity of TOF-MRA with 3T units compared with 1.5T scanners, though the 95% confidence intervals overlap (Table 2). This trend might be caused by the higher resolution of images created with a 3T MR imaging compared with 1.5T scanners.81 However, the sensitivity and specificity of 3T CE-MRA is lower than that at 1.5T, though this difference is not statistically significant. Again, the small number of studies researching CE-MRA at 3T limits the interpretation of results and might be the cause of this nonsignificant difference without reflecting any underlying inferiority.42,60,68,70,74 5) A final cause of heterogeneity might be the difference in study quality as judged by the GRADE criteria.12⇓⇓⇓⇓⇓⇓⇓⇓⇓–22 GRADE 4 quality studies tend to have higher sensitivity and specificity. This difference reaches significance in sensitivity for CE-MRA (Table 2). Weighted by GRADE, overall comparisons between TOF-MRA and CE-MRA revealed results that were similar to the overall pooled results. Our results provide a more detailed and updated evaluation of the accuracy of MRA for follow-up of coiled intracranial aneurysms than earlier work by Kwee and Kwee8 Our detailed subanalysis of results reveals consistently good performance of MRA techniques with pooled sensitivities and specificities well above 80%. For the important question of residual aneurysms (Raymond grade 4), CE-MRA even provides a pooled sensitivity and specificity >90%, with a lower 95% confidence interval of ≥85%. This meta-analysis has revealed that MRA has a high diagnostic performance when it comes to the detection of residual flow in the follow-up of intracranial aneurysms treated with endovascular coil occlusion and therefore should be routinely used for follow-up. CE-MRA did not perform significantly better than TOF-MRA, indicating that follow-up with the latter should be adequate. We would like to thank A.H.J. Tillema for support with our literature search. Disclosures: Joost de Vries—UNRELATED: Consultancy: Stryker Neurovascular (consultancy and proctoring); Stock/Stock Options: Stock options in relation to Surpass-Stryker Neurovascular; Other: Compensation for training courses for Stryker Neurovascular held at the campus of the Radboud UMC Nijmegen, Netherlands. * Ronald Bartels—UNRELATED: Board Membership: Secretary of CSRS-es, Comments: Only traveling costs and hotel costs for board meetings are reimbursed (*money paid to institution).